What makes a human future of work in the Midlands? A summary of Future of Work discussions from a series of events held in Birmingham this autumn, originally published here, on the Future of Work is Human website. Many would agree workplaces should be organised around people, but on a practical level, a ‘human’ future of work depends on issues specific to where individuals work and live. In September, CIPD Chief Executive Peter Cheese and members of the Future of Work is Human community headed to Birmingham to engage with local entrepreneurs, faith leaders, HR practitioners, businesses and thought leaders to spark ideas and explore partnerships for a better future of work in the Midlands. With the West Midlands a centre for micro-business, local employers discussed structures enabling HR professionals to collaborate with SMEs, scaling HR know-how and its application. Ideas also emerged about how to leverage faith and ethnicity in the workplace, making these an asset — a driver of change/vision — rather than a sensitive subject to be sidestepped. The conversation covered how existing structures can work to promote diversity, or whether entirely new frameworks are needed. The community proposed changes to working models geared towards unleashing creativity, a uniquely ‘human’ asset, which is likely to become more important as AI takes over more routine jobs. 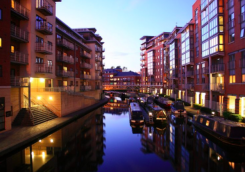 Named the most enterprising place in Britain by the UK Government (2016 Enterprising Britain Awards), Birmingham is one of the best places for growing small businesses. The 200,000 odd SMEs and micro-businesses account for 89% of all West Midlands’ business. While often employing staff, SMEs generally lack resources to employ a dedicated HR professional or tap into HR know-how. CIPD spoke of its People Skills program, which piloted shared, local HR services to give SMEs access to specialist support and advice on issues such as working hours, parental leave and optimising work practice. The system pools the insight and resources of a big personnel department, with access made possible on an occasional basis. Shared HR support matches the nimbleness of local enterprises: SMEs don’t lose out on valuable knowledge, and HR practices are effectively scaled and implemented. Another discussion explored faith as a catalyst for change in the future of work. Overall, there was a sense that Birmingham, a city built on faith — from its Quaker roots in the 19th and 20th centuries, to the Muslim and Sikh communities today — did not adequately benefit from its diversity, with communities continuing to live separate lives. Meanwhile, Britain itself is less a secular country than one with religious values deeply ingrained. There’s a richness in how people approach work from positions of religious faith. Talking about faith in terms of a fundamental belief in the good of a place and its future can potentially start a positive new dialogue. The idea of ‘diversity’ in business is trending, yet inequality persists. Going beyond mere quotas, what are the solutions? One reason current diversity agendas have limited effectiveness is because they are not embedded beyond token programmes. For example, networking opportunities often centre around after-work drinks, posing difficulties for non-drinkers, or parents of young children. To have any meaningful impact, diversity and inclusion must be woven into the fabric of an organisation. But to achieve this, differing approaches were debated. Some felt incremental change was what would work, whilst others pushed for a completely radical shift. Impact Hub Birmingham for example advocated creating new models from scratch rather than using terms traditionally associated with D&I. While it is hoped that younger generations would bring in different ways of working, the question hangs over the power they have to change current institutions from entry-level positions. To realise positive changes in the long term, we need bold visionaries, and a deeper connection to values. On another level, we will also need to collaboratively reinvent governance, culture and employment contracts. The group agreed that the CIPD and its members have a role to play in resetting the way businesses recognise ‘human’ value in the world of work, reimagining leadership to become more inclusive. There was a strong appetite for a framework for negotiating the tension between overarching organisational principles and individual differences. Table hosts at the open table event challenged conventional thinking on future workplace practice, and included (clockwise from top centre) Indy Johar, Co-Founder of 00 (on the awesome capacity of human beings); Amahra Spence, Artist, Producer and Founder of MAIA Creatives (on revolutionising work through art); (bottom centre) Imandeep Kaur, Co-Founder of Impact Hub Birmingham (on radically different approaches to diversity); Jonathan Chamberlain, Partner at Gowling WLG UK (on restoring labour’s true value). Indy Johar, Co-Founder of Project 00, posed a challenge about whether our workplaces truly unlocked the full capacity of individuals. An optimistic view was that radical automation frees people from frameworks that encourage them to be ‘bad machines’. The focus should be on how leaders — and the HR profession — can use AI to liberate people to for more ‘human’ jobs, unleashing that potential. Every human being you’ve ever met is more powerful than any AI. In a business context, people are seen as a cost rather than a source of value, and this needs to change. If a CFO runs the business, the driving force is the bottom line. This limits thinking about human relationships, both within the organisation and beyond. With innovation, a uniquely human contribution, we face the problem where attempts are being made to departmentalise it. True innovation doesn’t happen in a ‘lab’ — it comes from anywhere and can involve anyone. While management can never ‘know’ the future, they can encourage innovation to enable adaptation. It’s about building agile organisations ready for changes that are still undefined. Incentive mechanisms are needed for recognising innovation at every point in the system. High-value roles in the future will be about emotional intelligence. For over a decade, there has been full employment without real wage growth. Workers face increasing pressures from new technologies and accompanying changes to the workplace. The last time an explosion in technological growth occurred — in the 19thcentury — organised labour introduced adjustments to workplace models we currently take for granted (e.g. health and safety). However, today’s trade unions still operate on these old models of unionism. In a world where no one is irreplaceable, how do we establish a fair price of labour? Jonathan Chamberlain, partner at Gowling WLG UK, says a new form of labour organisation is required so technological developments are balanced by people collectively bargaining for the true value of their labour. This will be particularly acute as machines’ limitations become apparent. Numerous studies show nurses cannot be replaced by machines, yet nurses are some of society’s lowest-paid workers. The remedy to creating shared economic value requires social change. In the UK, anti-unionism is built into the way we think — arguably for good reason. Without big political change supporting employee representation, we must develop unions and other institutions that support it. New forms of unions exist — Ryanair and International Workers Union of Great Britain (e.g. the crowd-funded case against Deliveroo) are recent examples of how labour can be organised. Brexit may also uncover unanticipated issues around worker representation. But without sustained political support, attitudes are unlikely to shift. Artists can think both broadly and in minute detail, examining the subtle elements of the bigger picture. Resilience, constant graft and sustainability are integral concepts for them. How do we tap into this to revolutionarise work? Amahra Spence, producer and founder of MAIA Creatives, says that in the Midlands, there is a lack of infrastructure to create good work for artists. Funding for art and institutional support has collapsed, and any funding comes with economic strings attached — many artists relocate to London. Artists need policies to support them. In the Midlands, they urgently need local authority support. Art also needs public support to gain public funding. Artists need a voice to break the cycle. The artist mindset provides alternative vantage points facilitating deeper discussions. A running theme of the conversation was the intrinsic link between humanity and art, and art’s capacity to facilitate collaborative working and leadership. We need the creative confidence to develop unique, innovative thought processes generative of change. Within traditional companies, good governance is needed to provide opportunities for being creative. Reevaluating value – new models needed? Another debate focused on the need to rethink the capitalist system. The common assumption is that the system works, but we know from evidence it does not always work to support wellbeing for example. This raises the old question of whether capitalism works to metrics other than profit. To balance the current system, participants felt we need to measure factors including social cohesion and inclusion, alongside GDP and productivity, holding businesses to account on these metrics. Individuals often make compromises, choosing cost efficiency over personal values. While each should take responsibility for their actions, society itself should be challenged to stand for issues important to global citizens, not just consumers. Institutions provide legal frameworks for what we believe in as a society. Organisations should support the legal, moral and political elements in the system that create incentives to do ‘the right thing’. A post-capitalist society could rely on a resilient, sustainable and human system, where we take universal wellbeing and fair work as granted. This requires each of us taking personal responsibility for our actions, pushing for collective action. HR leaders will have a specific and important role to play here. The ideas that came about through these conversations has further underscored the point that breadth and diversity of opinion (and geography) enriches our thinking on the future of work. Community members taking part agreed one or two pilot schemes should be developed to maintain the West Midlands momentum, in addition to scheduled follow-up meetings with regional mayors and policy makers. These pilot schemes could include a People Skills scheme with Impact Hub as well as a working group on ‘Faith in the City’, possibly involving more faith leaders and extending into issues of youth representation/participation. This would be an interesting, forward-looking take on the diversity and inclusion agenda.